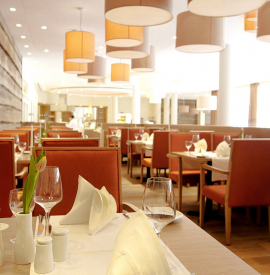 Every day from 12 pm to 2 pm and from 6 pm to 21:30 pm, our gourmet restaurant Brunshaupten opens its doors for you. As a guest, you not only experience a fantastic view of the sea, but above all delicious fish dishes in many variations. Whether it's a tasty zander fillet, shrimp or tuna, let us taste our delicacies - always exciting, new and prepared with "real" craftsmanship. Choose daily from 6 pm at our fish counter, which daily fresh fish to be prepared for you. A gastronomy that leaves nothing to be desired. 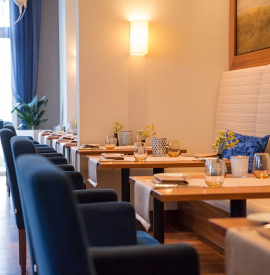 In our restaurant Fulgen, you will come at your culinary cost. Here, you can enjoy our gourmet breakfast buffet every day until 1 pm. In the evening, you can also look forward to a dinner or dinner buffet as part of the half board. In addition to indoor space for over 120 guests, there is a sun terrace. More than 800 square meters large and very unique for Kühlungsborn. For a perfect start of the day: Let yourself be spoiled by our rich late riser breakfast in the restaurant Fulgen until 1 pm. In addition to a live cooking station, you can enjoy a wide selection of hot and cold specialties as well as coffee, tea, juices and prosecco. Depending on the choice of the chef, you can look forward to an evening dinner or buffet in our restaurant Fulgen.